Although the saying goes “a picture speaks a thousand words”, as ironic as it sounds, sometimes all you need might just be a thousand words or more to make up a picture. Most of the time, posters take on pictures as a whole and the using of words is kept to minimal. However, typography posters are design in the exact opposite manner, to simply explain it, typography uses words or characters to create a picture, in fact one could call it a form of legible art, where you can literally read the art itself. And lately the popularity of this genre has also earn itself a custom designed App in the market. Generally, typography is a genre in art; the main technique is where one uses just words or characters and arranged them in such a way to create a graphic or an art print. This genre is not easy, it takes up a lot of patient and is time consuming, however the outcome is worthwhile for those who attempt it, seeing that the effect is always a sight to behold. While pictures present a more graphic way to convey a message, words are just as effective when one is trying to convey message in a more detailed manner. Designers uses different types of beautiful typography for their designs, each type of typography allows them to convey a different message and will directly affect the outcome of the art. Some of the common typography used are cursive typography, bold, dramatic and some designer will also design their own custom typography to create a particular effect for their art. Some of the typography posters are design without much arrangement, allowing the viewers to understand the art, focusing more of the typography themselves. For designers who are more creative, they tend to arrange their typography into portraits, figures, pictures or other graphics. While the mainstream typography uses alphabets there are also those that uses characters from different languages, such as Japanese, Chinese and Arabic characters. While, typography posters are normally design in a 2D format, there are also creative designers who attempt to design their work in 3D format and the affect itself is astounding. Typography posters are suitable to be used during concerts, events, festivals and for campaign promotions. Here, we have prepared a collection of unique, attractive and beautiful typography posters for your reference. We hope this collection will help you to explore more in this particular genre, who knows, your experiment might just create a different kind of art. If you liked our selection, perhaps these other posts will interest you too, Surreal Art Photomanipulations, Creative Infographics, Social Media Infographics, and Vector Illustrations. A portrait of a Japanese singer made in typography. A poster using only typography. Design for a yearbook’s front cover. A product created by inspiration for inspiration. Collections of typography posters from Samuel Sinaga. 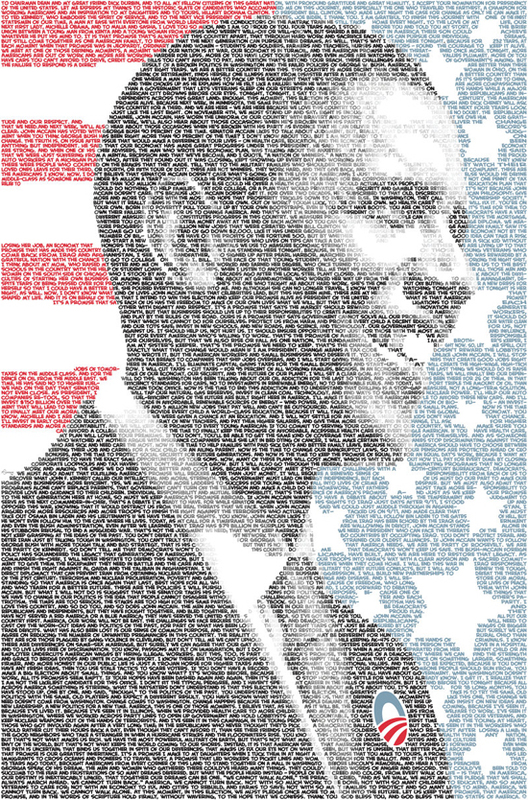 A portrait of type-face Obama. Typography poster with very cute font. Design theme is to make a synthesis of needs + information + color. A poster to answer the question of “What is Graphic Design”. Typography plus a beautiful girl! Poster design to encourage Japan due to its recent earthquake and nuclear disaster. I Hope You Like The Stars I Stole For You. A Japanese typography designed by layering hiragana wordings over one another. Typography poster for a band. A typography poster consisting handwritten calligraphic logos. Really creative idea combining robot and typography art! A typography poster designed with pictures of human and other graphics. A pamplet cover to a music festival. A personal design for vintage art. This typography poster is available for purchase. A poster using fashion and cosmetics as themes. An adorable take on typography design. Part of SeventhStreet’s new marketing campaign that encourages people to recycle old images and create new ideas. Towers design with arabic typography. A poster for a new tech-house events project in Athens. An interpretation of a quote by Alan Fletcher. Typography poster collections by Michal Bialogrzywy. Cover designed for the Belgian Festival in Nijvel. A poster designed for 3D illusion. A typography poster created for school. A poster with only a simply design. Created while playing Call of Duty games! A typography poster with a classic and minimal design. A heart shape made of words. A very strong message to be heard. An artist is nothing without the gift but the gift is nothing without work.